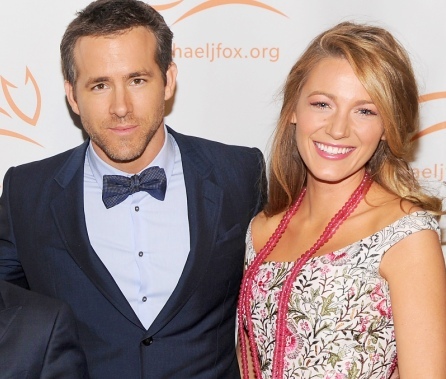 Washington, Jan 6 : Blake Lively has given birth to her and hubby Ryan Reynolds' first child, it has been revealed. The 27-year-old actress, who had tied knot with the 'Green Lantern' star, 38, in a secret ceremony in 2012, had announced the pregnancy in October through her lifestyle website, Preserve, by posting a stunning image of her baby bump, E! Online reported. Washington, Dec 04 : Blake Lively has recently admitted that her "poor husband" Ryan Reynolds has to put up with her Christmas obsession. The 27-year-old pregnant actress said that it was very hard work coming up with her high-end Preserve gift guide because she loves anything and everything that has to do with the holiday, E! Online reported. London, Oct 25 : A source has revealed that Blake Lively and Ryan Reynolds wish that their baby could have a "normal childhood". The 'Green Lantern' stars wanted their baby to experience all that normal kids do and reportedly said that the baby would be raised out of LA and the '' Hollywood'' lifestyle, the Mirror reported. The 27-year-old actress is thankful to have a great pregnancy so far, and has been allegedly planning on some more babies. The 'Savages' beauty has said that as she had been brought up in a big family, it was important for her to also have one and that she would love to have lot of kids. London, Oct 18 : Blake Lively recently gushed about husband Ryan Reynolds and said that he was destined to a "great father," as well as leader and patriarch. The 27-year-old actress also mentioned that the 'Safe House' actor has always been good to her and have also taken very excellent care of her throughout her pregnancy, the Mirror reported. The Gossip Girl star, who is expecting her first child with Reynolds, can't wait for her baby to arrive. Was hington, June 15 : Blake Lively and Ryan Reynolds are ready to start a family together and are keen to put it before their careers. According to insiders, the 26-year-old actress initially planned to hold off starting a family with her husband, because she wanted to focus on her career, but has now decided becoming a mother is more important to her, Contactmusic reported. New Delhi, May 21 : From Blake Lively's messy braid to Frieda Pinto's ponytail look -- the 67th edition of Cannes Film Festival has witnessed out-of the box hairstyles. Expert doles out tips on how to achieve the same red carpet look with ease. Los Angeles, Aug 22 : Actress-model Blake Lively says her hair is her security blanket and that she would never cut her long golden locks. "My hair is my security blanket, it helps me conquer my shyness. I like having a lot of it, like a curtain, and I especially like it to look natural, like it hasn't involved any effort," femalefirst. co. uk quoted Lively, 25, as saying. "My secret for that is my Mason Pearson hairbrush, which gives my hair volume and shape," she said. The "Gossip Girl" star also admits that taking care of tresses takes a lot of time and effort. Los Angeles, July 30 : Actress Blake Lively says her husband Ryan Reynolds has better taste when it comes to building their home together. The couple got married last September. "I'm very lucky to be with someone who has better taste than me. We influence each other in different ways," femalefirst. co. uk quoted Lively as saying. "With film and TV, you don't see the results for months. Building a home, you get immediate gratification," she added. The actress admits that her personal life is her priority. New Delhi, July 1 : Actor Ryan Reynolds says he rarely goes anywhere without taking his actress wife Blake Lively's approval on his looks. "I would never walk out of the house without her approval," the "Turbo" star said in a statement. He recently attended the premiere of his new animation film "Turbo" in Barcelona, and later went on a romantic date with Lively in the city. "Turbo" is a 3D comedy about an underdog snail whose dreams kick into overdrive when he miraculously attains the power of super-speed.